Services Provided – Raskin Resources Production Inc.
Patricia Raskin will help you design, develop and deliver your on-demand podcast series. 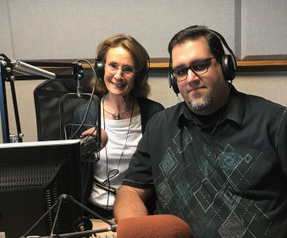 Patricia Raskin and Tony Jones of The Tony Jones Show, talk show host and podcaster, talk about how to get the best from radio shows and podcasts. Learn about getting your message across to listeners through your own podcast series. Have you ever thought of putting together your own podcast series? Podcasts are on the rise. 67 million Americans listen to podcasts monthly, up 14% from last year. 42 million Americans listen to podcasts weekly, about 15% of the total US population. Podcast listening growth is steady, with 10 to 20% increases annually. Do you want listeners hanging on your every word? Would you like to reach your targeted customer base? Do you value both state-of-the-art content AND sound delivery of your message? I have expanded my work to podcast coaching and productions for experts like you who want to create their own podcast series and fast track their success. Your podcast series is an episodic series of digital audio files that your listeners can subscribe to. The finished product is your branded podcast series that is hosted on top rated podcast networks (e.g. : Spreaker.com, iheartradio.com, or iTunes.com). Why do your own podcast series? Share your passion and expertise with listeners. You gain name recognition as a trusted resource. Listeners identify you as the expert and storyteller that they want to hear on-demand, when and where they choose! Drive traffic to your website and increase your SEO (search engine optimization). Better content increases your numbers which translates into more business. Capture listeners on your podcast through social media and website promotion. Use your social media channels and website to let your current clients and new listeners know about your podcast series. Increased avenues to search and locate your podcast. Listeners can intuitively “surf” and find you on podcast hosting sites (iTunes, iHeartRadio.com, etc.). As an award-winning radio producer and radio/podcast talk show host and coach, I have about 15,000 listeners on both my broadcast and internet/podcast networks. “The Patricia Raskin Show” is in its 10th year on Cumulus Broadcasting’s WPRO. My internet/podcast program is in its 15th year on VoiceAmerica.com, now available on iTunes. I have coached many new talk show hosts. My media programs have aired on Fox, PBS and NPR affiliates. I have interviewed over 3,000 guests, including Dr. Oz, the late Maya Angelou, Marianne Williamson, Dr. John Gray, Jack Canfield and Joan Lunden among others. Over 80 years of experience from myself, Tony Jones and Chris DiPaola. Tony Jones, our podcast technical producer, has music podcasts breaking the “Top 20” charts, and hosts “The Tony Jones Show” on iTunes. Chris DiPaola, our media consultant and President of DiPonti Communications, owns three RI radio stations with experience as host, producer and general manager. Coaching/training before, during and after your podcast series. Three 20-minute segments which create your first series. Podcast series recorded (in the studio or remotely through SKYPE), formatted and uploaded to a podcast network. A subscription link for listeners on your website and suitable for social media. An MP3 podcast of the series for your website. This is a rich and comprehensive package that includes coaching, production, and broadcast. This includes a marketing consultation after your podcast is produced to promote your program and a segment interview on Patricia’s show on WPRO. For fees and to schedule a complimentary call me at 401-440-6299 or patricia@patriciaraskin.com. Create a podcast series that will have your listeners coming back for more!